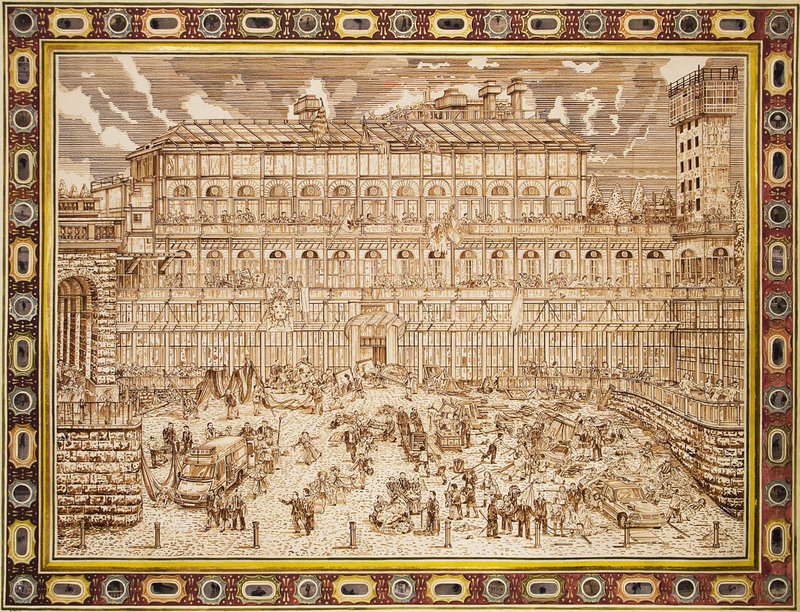 Image credit: Adam Dant, PALAZZO PITTI, 2009. Sepia ink and gouache on paper, 183 by 238 cm. Courtesy of the artist and Hales Gallery. Adam Dant makes lavish and richly layered drawings which take the viewer on an inventive and imaginative visual journey. His subjects are always meticulously researched and the resulting works can take many forms including maps, charts and visual allegories. The elaborate scenes he depicts are often located in recognisable spaces, places and institutions. For this exhibition, Adam is creating new drawings which explore British attitudes to drinking. Initially inspired by George Cruickshank’s The Worship of Bacchus as well as by numerous European depictions of celebration and revelry, his work wittily explores this topical theme whilst directly engaging with a strong historical tradition. A time lapse film of Sun K. Kwak installing Dual Force at The New Art Gallery Walsall.